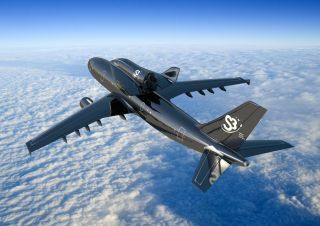 The Switzerland-based Swiss Space Systems announced plans to launch a privately built SOAR unmanned space plane from an Airbus A300 jetliner by 2017 for small satellite launches. A Switzerland-based spaceflight company is finalizing plans with Canada over a potential launch site for a new private space plane, which is slated to launch a satellite to clean up space junk by 2018. The company, Swiss Space Systems (S3), plans to launch the new Clean Space One satellite using the European Suborbital Reusable Shuttle, a small space plane the firm is developing for low-cost launches off the back of a modified Airbus A300 jumbo jet. CleanSpace One is chasing its target, one of the CubeSats launched by Switzerland in 2009 (Swisscube-1) or 2010 (TIsat-1). Image released Feb. 15, 2012. SOAR developer S3 is CleanSpace One's primary sponsor, and will pay $5.3 million for assembling and testing the satellite's components and ground-based command operations. The company has also set aside $10.7 million for its own SOAR launch system. North America and Spain are home to candidate launch sites for the SOAR space plane, so S3 officials have been talking to the U.S. government's Federal Aviation Administration, its Canadian equivalent, Transport Canada and the European Aviation Safety Agency, of which Spain is a member state. "In 2018, [CleanSpace One] this will be one of our first launches, if not the first one," Grégoire Lorétan, head of S3 communications, told SPACE.com in an email. Lorétan added that S3 would have an announcement about a partnership with Canada in "a few weeks." CleanSpace One's first satellite target for a de-orbit demonstration will Switzerland's SwissCube nanosat to avoid potential legal issues or other concerns surrounding the de-orbiting of a satellite owned by a party from another country. A satellite that can dock with and deorbit a spacecraft could potentially be used as a sort of anti-satellite weapon. In addition to the CleanSpace One effort, EPFL has been working with the European Space Agency on new technologies for spacecraft propulsion, navigation, reconnaissance systems and hardware for anchoring a satellite to pieces of space debris. Switzerland's Swiss Universities of Applied Science and the Eidgenössische Technische Hochschule Zürich, in the Swiss city of Zurich, are providing technical know-how and technology. In 2012, EPFL predicted then that CleanSpace One would cost $10.7 million to design, construct and launch and that the first orbital rendezvous would occur by 2017. Gass told SPACE.com that the EPFL envisages a family of spacecraft for the various sizes of debris, yet he added the organization will not enter into the business of providing debris deorbiting services. Lorétan confirmed in his Sept. 12 email that S3 would also not provide a debris deorbit service. Acknowledging that the CleanSpace One technologies can be used to extend a spacecraft's lifespan, Gass told SPACE.com, "[life extension] it is a very good approach and we are also looking into these elements and this is the whole topic of orbital debris in general, not just the CleanSpace One mission." Orbital had identified 140 commercial satellites that by 2017 could have been serviced by its 1,000-pound (453 kg) spacecraft. Kosmas' refueling spacecraft, called Hermes, had a customer with Middle Eastern satellite operator Arabsat. Kosmas had priced its refuelling services at up to 10 million euros ($13.2 million) per 110 pounds (50 kg) of propellant. The U.S. Department of Defense has looked at similar technology. From 2003 to 2008, the military's Defense Advanced Research Project Agency (DARPA) performed studies such as the Spacecraft for the Universal Modification of Orbits (SUMO) and Front-end Robotics Enabling Near-term Demonstration from 2003 to 2008. DARPA's SUMO website stated that, "SUMO can perform station-keeping and attitude control and modify the spacecraft’s orbit," indicating the military’s interest in deorbiting combatant’s uncooperative satellites. In 2007, DARPA successfully carried out an in-orbit servicing demonstration mission with its Orbital Express vehicle. The agency is currently developing the Phoenix space debris cleanup and salvage satellite, which would use parts from dead satellites to fix other satellites or build new craft in space. This artist's illustration shows the Swiss Space Systems unmanned SOAR space plane gliding back to its spaceport after launching a small satellite. In addition to CleanSpace One project work, S3 announced on Sept. 30 a launch deal to launch 28 satellites for the Swiss microgravity medical experiment specialist Spacepharma, which is based in Delémont city in North West Switzerland. Under the deal, S3's SOAR space plane will launch four of Spacepharma's 11-pound (5 kg) satellites in 2018 and the remaining 24 spacecraft are to be orbited by the suborbital shuttle at a rate of one per month over the following 24 months. Spacepharma's satellites are based on Cubesat technology and will carry medical experiments onboard. The company hopes to eventually evolve its small spacecraft design into a larger 110-pound (50 kg) version. S3 already had four launch agreements with one of its partner organizations, Belgium's Von Karman Institute, a fluid dynamics research, prior to the Spacepharma deal. For more than $10 million, the reusable SOAR space plane will carry commercial satellites from 33,000 feet to an altitude of nearly 50 miles (80 kilometers), but not beyond the accepted boundary of space, which is 62 miles (100 km). The satellites are released from SOAR's cargo bay at an altitude of 50 miles, with the payload's own rocket engine then igniting to kick it up to about 434 miles above the Earth. SOAR’s maiden flight is planned for late 2017. Lorétan told SPACE.com in his Sept. 12 email that SOAR's Systems Requirements Review, which is a basic design review, would come later this fall, and S3 would "communicate about this milestone soon." The total development cost for the SOAR launch system is estimated to be about $214 million. Lorétan declined to say who is providing the funds, but confirmed that the funding was in place for this year and "our budget is covered by our partners and private investors." After releasing its cargo SOAR glides back to its spaceport, which could be in the United States, Canada or Spain or in the other candidate sites of Malaysia and Morocco. S3 expects to be making an announcement soon about the progress of its partner Spaceport Malaysia. Just before reaching its target, CleanSpace One unfolds its bio-inspired gripping mechanism. Image released Feb. 15, 2012. However, Lorétan held out the prospect of satellites being thrown higher and further, as at S3, they "know that the SOAR has the capability to go up to Mach 10 [10 times the speed of sound] as a drone for the launching of satellites," he stated. SOAR will initially reach three times the speed of sound for its passenger flights from 2020, while reaching the speed of Mach 10 will enable SOAR to make transcontinental point-to-point journeys, Lorétan added. Lorétan expects that manned flight tests will be carried out with the help of ESA's European Astronaut Centre and Franco-Italian company Thales Alenia Space. Thales, one of S3's partners, provided pressurized vessels for the International Space Station and it has signed a contract with S3 for that technology. The pressure vessel will initially be used to carry experiments and the technology could create a passenger cabin. In March, S3 told SPACE.com that it planned to announce in April the company providing SOAR’s liquid oxygen and kerosene-fueled rocket engine. In his email, Lorétan said: "We don't communicate this information due to signed [nondisclosure agreements] NDAs. What we can mention is that the engine of the SOAR and the upper stage both come from the same country and we are currently discussing the issues related to the export of these engines." However, on Sept. 23, S3 announced a partnership with Russia's Bauman Moscow State Technical University (BMSTU) stating that BMTSU students will, "pursue their research work in relations to S3 propulsion systems, one of the key elements for the SOAR shuttle and its expendable upper stage." The university has produced engineers for the Soviet Union and subsequently Russian space programs and Russia is the country with the most experience in liquid oxygen and kerosene rocket engines.